Here are some commonly asked questions about Ashiatsu massage and our Barefoot Masters Training Courses. Are these classes for you? Is there a weight height or weight limit? Do I need tremendous upper body strength? No, not unless you plan to take advanced work. Do I need to be a Licensed Massage Therapist to learn this? What if I don’t see a class in my area and can’t travel? We have online and home study courses that come with certification. Or if you have at minimum of 6 people to commit then I will come to you. 1/2 the class fees will need to be paid before instructors airfare is reserved. Then the rest before the instructor boards plane. What is the difference between this course and the other companies? The materials from our program were developed to increase the learning outcome and practice of each modality. Courses are available in a live course, online or in a home study format. One of the major differences is you receive all the educational materials for class in advance. We believe in preparation. Barefoot Masters® has been teaching continuing education for over 15 years. Approved by NCBTMB, ABMP, AMTA, Florida, Lousiana, Tennesse, New York and most states that accept NCBTMB. Contact us to make sure your state is included. 239-352-8200. Massage has been around long before we were born. Most modalities are derivatives from other cultures. Comparatively, we make no claim to be “The Originals” as that would be arrogant. However, we will say our programs have been developed to allow all therapists to learn, and participate, regardless of height, weight, or other restrictions. Our program is not centered around the founder. Nor do we speak ill of others who teach similar modalities. Basic Ashiatsu is basic, no matter who it’s learned from. Our Bamboo course differs in our tools and it is taught for deep tissue work, but can be done as light as a Swedish. What will I learn and how is certification awarded? All online courses and home studies need to take Test and fill out an evaluation form. With the acceptation of New York who needs to fill out a log sheet as well. For Ashiatsu Bar or Ashiatsu Floor: These courses include both the anterior and posterior routine. Certification is awarded during the 2-day class. For Bamboossage® Table Massage: One day course includes anterior/posterior and certification is awarded in class. Bamboo2Go® Chair Massage: One day course includes anterior/posterior and certification is awarded in class. Fijian: One day course includes anterior/posterior and certification is awarded in class. Stones2Go®: One day course includes anterior/posterior and certification is awarded in class. Will I be certified after I take the course? Or do I have to come back after I practice so many hours? At this time the 2 day course requires a practical test on last day which is done on an instructor. Upon passing, you will be certified. Unless you are unsafe or unable to perform in class due to pregnancy or other reason,then you will be awarded your Contact Hours. What is the difference between Ashiatsu Bar Therapy, Ashiatsu Floor and Fijian Massage? Ashiatsu bar therapy is done on a table with bars suspended from the ceiling for balance or a set of portable bar system. The client is undressed and lotion is used. This compression work with effleurage. The feet feel like hands and most clients can’t tell the difference. There is always one foot on the table. (Except for advanced work). Ashiatsu Floor is the same except without the bars. Stools or Floor Bars are used and the client lies on the floor on a mat with pillows and a face cradle. Fijian is a barefoot technique more likened to neuromuscular massage work using the feet to apply detailed movements. The client is fully dressed and lies on a mat or pillows on the floor. The therapist can either apply the technique standing or sitting on a stool. What makes your stone class different from others? This stone class eliminates time-consuming preparation and clean up. It can also be taken out on house calls. It is recognized by any state that accepts National NCBTMB CE’s, the State of Florida and Louisiana. Will you cover installation of bars in class? Yes, the schematics and installation instructions are in the Ashiatsu Bar Therapy digital manual which you receive once the hold fee has been purchased. Time devoted to this subject is included in class tuition. Do you sell portable bars and can they be used in my office with my existing table? Portable bars schematics are available, so you can make your own. We do not sell the over head bars, but you can purchase the Floor Bars. Check the website. Will you teach us how to market this modality? Absolutely! Marketing is explained in class and cover in your manual on how to introduce it to clients. How to advertise. What to charge. It has not happened as of yet. Half the class fee is required to hold spot. If student cancels then the fee can be applied to another class of same instructor. There is a $50. change fee to switch to another date or fee can be applied to an online course. Classes in Naples are not canceled. Even if there is only one student. The class is taught as a private. You are free to make flight arrangements as it is highly unlikely. However in the event of an unforeseen circumstance of instructor, then all monies will be refunded. If there is a hurricane then class will be rescheduled and refunds will be discussed if necessary. If instructor is traveling to a class, check with instructor before reserving a flight, to make sure there is not a possibility of cancellation. Barefoot Masters, Inc. is not responsible for flight reimbursements or hotels. What is Barefoot Master’s shipping and return policy? All domestic shipments are sent via USPS or UPS and shipping is free unless otherwise stipulated. International shipments are not free and are handled separately. Please contact us to discuss shipping rates. All payments are final, no returns are accepted. Bamboo tool sets can take two weeks for shipping. Will I have to sign a contract to take our courses? No. If you are being asked to sign a contract, then you need a lawyer. If you need a lawyer to take a class, you should first take a class on how to run! We do have a license agreement if you decide to become an instructor and use our materials. During the checkout process, you created a password. Visit the login page and enter your email address and password. 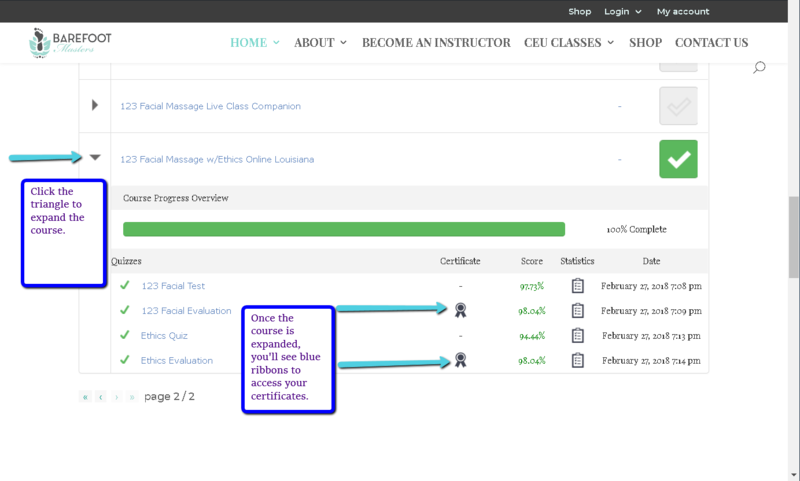 Then scroll down the page to your enrolled courses section. If you’re seeing a login form on the page, you’re not logged in yet. It happens to all of us! Under the login form, click “forgot password” and enter the same email address you provided during the checkout process. If you haven’t received the link to reset your password in 10 minutes, be sure to check your spam folder first, then email us. Great question, after completing the entire course (including the evaluation), go back to your account and expand the course. You’ll see a blue ribbon, click to open your certificate in a new window. What if I can't access the video or online ebook? We’re sorry for any trouble you experience while taking our courses. Check your browser type. Internet Explorer is a legacy browser type and may not give you the best internet experience.